I’ve been looking forward to Indiana’s visit to the real Assembly Hall for months so that Hoosier coach Satan’s Spawn could receive a few choice words from the Orange Krush. Illinois rose to the occassion by winning a bruising game last night marked by aggressive defense by both teams on the floor. (By the way, have you noticed the Super Bowl symmetry over the last couple of days with a Bulls – Pacers game on Monday followed up by last night’s Illinois – Indiana game? OK, maybe it was just me.) 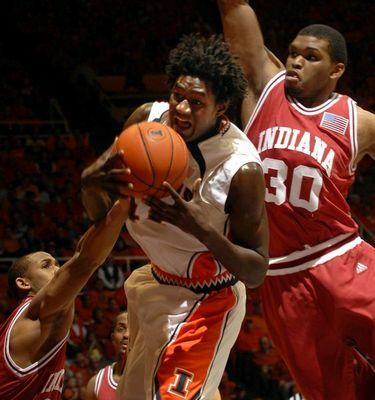 However, for all of the attention paid to the Bruce Weber – Eric Gordon – Satan’s Spawn triangle last night, the more important matter is that the Illini have salvaged some hope to get back into the NCAA Tournament, although we’re still in some dangerous NIT territory. Not surprisingly, the Big Ten this year has turned into Wisconsin, Ohio State, and then everybody else. There’s a good chance that the Illini won’t be facing another ranked team for the rest of the way (save for possibly the corresponding road game at Indiana on February 10th), so getting a win against the Hoosiers was critical to our NCAA Tournament resume. Even then, an above .500 record in conference play is going to be the bare minimum this season, which means that we need to go 6-3 the rest of the way (Illinois is currently 15-7 overall and 3-4 Big Ten). My gut is telling me that the away game at Purdue this Saturday is dangerous, particularly since it follows such an emotional contest, while future second games against Indiana, Michigan, and Michigan State are all going to be tough matchups regardless of whether Brian Randle and company are healthy. That means the Illini are going to have little margin for error the rest of the way if there’s going to be a reasonable chance to get back to the big dance. For now, though, Illini Nation can revel in the fact that we were able to vanquish Satan’s Spawn last night. Repeating this again in Bloomington in a couple of weeks would be even sweeter.